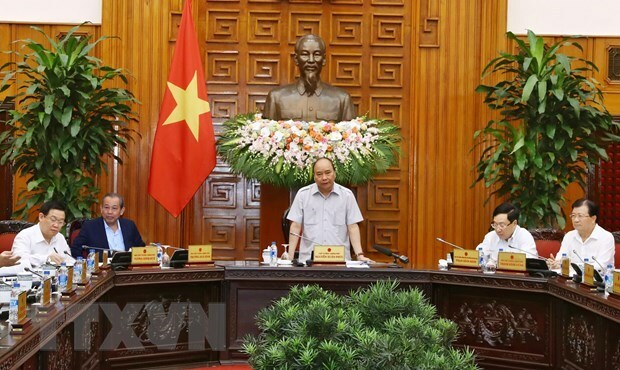 Hanoi (VNA) – Prime Minister Nguyen Xuan Phuc chaired a cabinet meeting on April 11 to discuss controversial issues of a draft decree on the use of public property to pay investors in build-transfer (BT) projects. Cabinet members agreed that BT projects, which are invested in by businesses who will be paid with assets and goods rather than money, are necessary amidst the modest State budget resources. Over the years, losses were reported in a number of BT projects, especially those that investors get paid with land, as the land value was calculated lower than the market prices. On December 28, 2018, the Government issued a resolution adjusting BT projects signed before January 1, 2018. However, in order to remove obstacles in implementing such projects, the Government assigned the Ministry of Finance to draft a decree regulating the use of State assets to pay BT project investors. Representatives from ministries and sectors debated a number of issues, including the bidding of BT projects and land use at the same time. Addressing the meeting, PM Phuc clarified that BT is still a necessary investment format at present, which is allowed by the Law on Public Property Management 2017. He asked the Ministry of Finance to continue collecting ideas on the draft decree, thus ensuring its efficiency which is hoped to open up broader spaces for optimising resources for national development. The PM requested the ministry to submit the draft document within April. The same day, the cabinet also evaluated the implementation of the Law on Planning, aiming to seek solutions to difficulties during the process. A report from the Ministry of Planning and Investment shows that due to a lack of documents specifying the implementation of a number of the articles of the Law on Planning, ministries, sectors and localities are unable to make new planning for the 2021-2030 period. Ministries’ failure to submit to the Government six decrees guiding the realizations of the law on the adjustments and amendments to a number of articles of 37 laws related to planning has caused difficulties in making technical and professional planning, it said. Meanwhile, the Government Office reported that 39 national sectoral and 63 provincial zonings have yet to be implemented due to a lack of specific guidance. At the same time, land use zonings of five localities for the 2016-2020 period are unable to be issued for the same reason which also affects 25 zoning of sectors, and nearly 370 projects. Concluding the meeting, PM Phuc noted that there are about 17,000 zonings at all levels with overlapping, requiring the elimination of some. Therefore, the implementation of the Law on Planning is crucial. He assigned Deputy Prime Minister Trinh Dinh Dung to continue directing the removal of difficulties in the realisation of the law.